You’ve heard the tagline but can you believe it? You bet. Here are 15 tips and tricks that explain exactly why the original Anaheim resort really is the Happiest Place on Earth. There are no buses necessary to get from a to b, or b to c, or anywhere else inside Disneyland Resort. The two parks, Disneyland Park and Disney California Adventure Park are less than 100 metres apart. Yes, there’s a monorail, a working steam train, trams, canoes, submarines, even horse-drawn carriages which can be used to get around, but the entire resort is manageable on foot. That means less waiting in lines and consulting of schedules. Ok there’s one plane, and it’s not a short flight, but one long haul stint, and you’re disembarking in Los Angeles. In no time you’ll be on the Disneyland Express bus that takes you from the front door of Tom Bradley airport to the front door of your Disneyland hotel in under an hour. From there, as per above, you don’t need to hop in a car again for the duration of your trip. Scared off by the idea of spending hours waiting in line for a ride? Don’t be. Disneyland has long offered FASTPASS, where you can skip the queue at an allotted time, but now there’s an even easier system. Instead of having to go to the ride to pick up your FASTPASS, you can do everything on your phone, in the Disneyland Resort App. Download the app, link your ticket, purchase a MaxPass (just $10USD for the entire day) and choose rides based on selected time frames. Turn up at the allocated time frame, scan your MaxPass barcode, ride, then choose your next MaxPass. The MaxPass can only be purchased once you are physically inside the park each day, which means unlike other online fast pass systems, you don’t need to pre-book rides days in advance. It’s been a long day of magic moments, adrenalin rushes and sugar highs. The fireworks are the icing on the cake. At this time of year, it’s the special “Believe… In Holiday Magic” fireworks show. The final fireworks erupt into the night sky, lighting up thousands of happy faces. But then, it starts to snow. Yes, in California, at a comfortable 25 degrees Celsius. And wait, the snow seems to be Christmas spice-scented. The foamy snow floats through the sky to land on upturned faces just as the Christmas carols crescendo. Now this is the magic of Disneyland. As if Disneyland didn’t already have enough happiness to go around, at Christmas time everyone ups the ante. There are Christmas decorations everywhere – we’re talking giant Christmas baubles, 10 foot wide snow flakes, a festive food festival (eggnog macarons anyone?! ), dozens of Christmas trees, several santas, and even roaming carolers who draw the big crowds to their merry acapella performances. We challenge you not to sing “Here comes Santa Claus under your breath” all day! 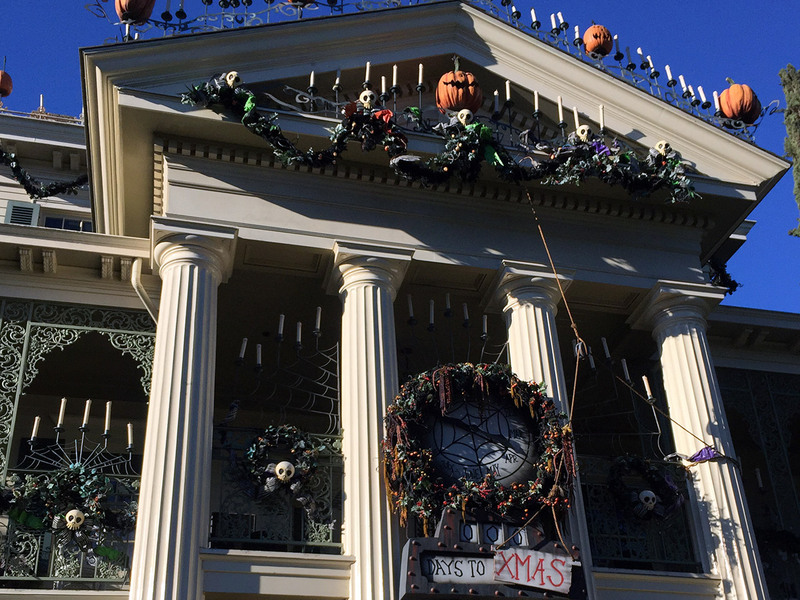 And then there’s the takeover of the famous Haunted House – each year the ride is transformed into the Nightmare Before Christmas. Expect lines for this quirky, slightly creepy Christmas tale. Located just 45 minutes from the heart of Los Angeles, Disneyland is the theme park of choice for American celebrities – even Australian ones. Rebel Wilson is a dedicated fan, spending her Thanksgiving at the park, so keep your eyes open. Don’t be surprised if you’re caught out thinking there’s a Hollywood heavyweight from crowds of people – it might just be Mickey making a photo appearance! Deep fried, sugared dough in stick form – what more could you ask for? 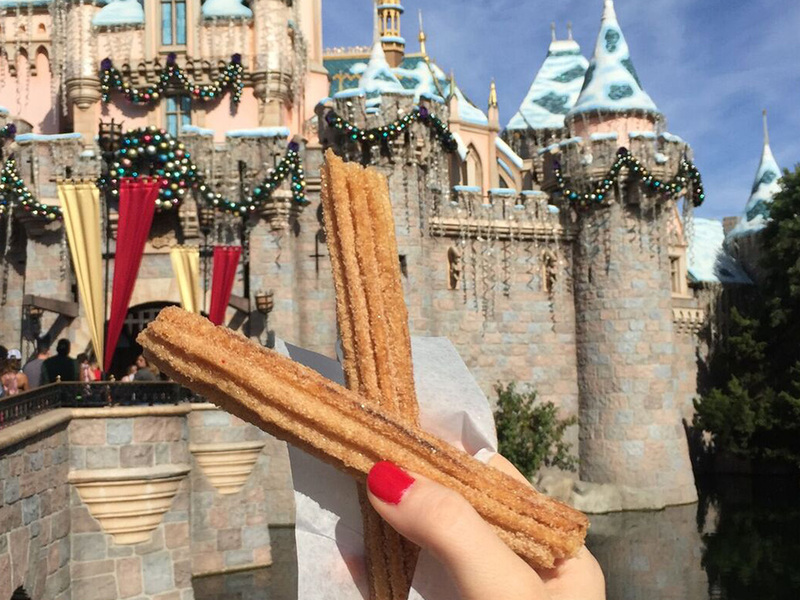 Perfect for a sugar hit on the go, Churros is one of the signature Disneyland treats. You’ll find them at carts all over both parks, filling the air with a mouth watering aroma. Even though this is the original Disneyland, opened by Walt Disney back in 1955, the parks certainly don’t rest on their laurels. 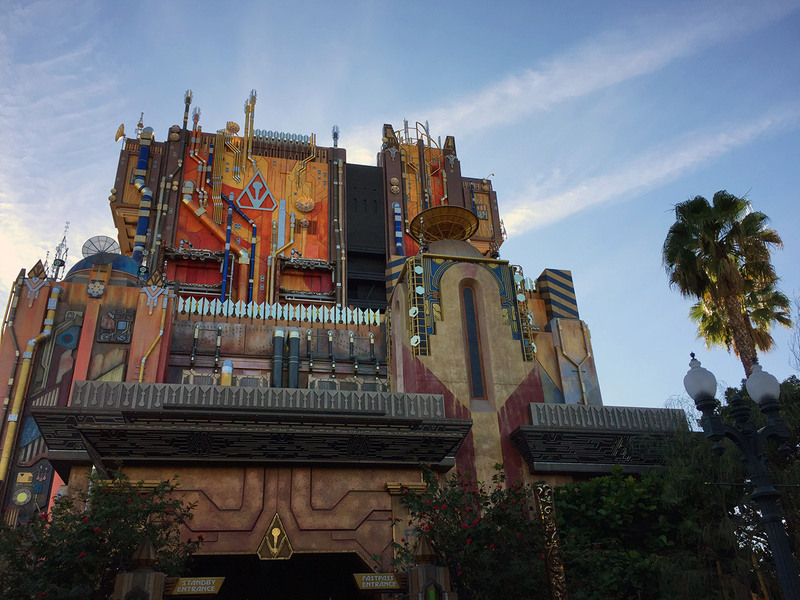 Guardians of the Galaxy – Mission: BREAKOUT! is the newest ride, bringing Marvel to California Adventure Park in a very big way. Big news is next year’s transformation of the park’s Paradise Pier into Pixar Pier, with four new neighbourhoods inspired by Pixar characters and the reimagining of the iconic Californian Screamin’ into the Incredicoaster. 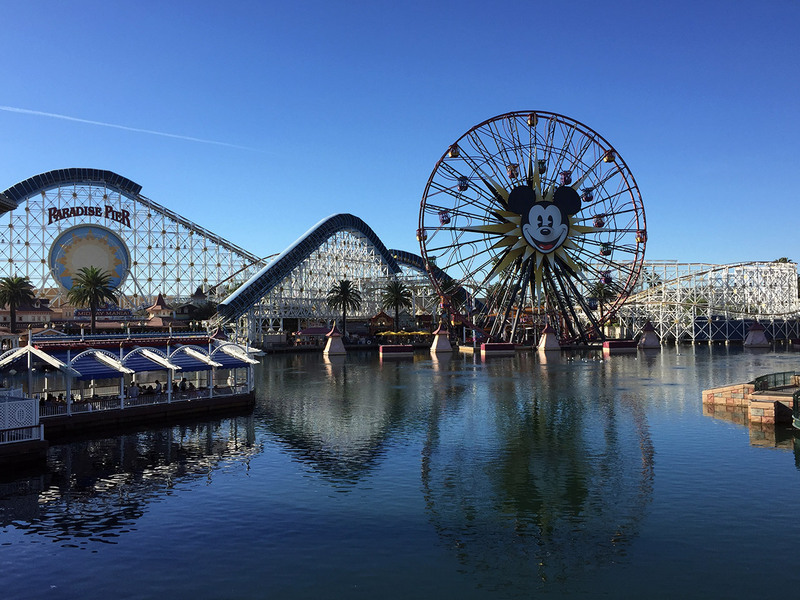 Pixar Pier opens mid next year, but from April Pixar Fest will take place across the resort, with parades, new fireworks shows and light projections. A 3-5 day visit is the bare minimum for soaking up the magic, and four days is the real sweet spot. For a limited time only, Aussies and Kiwis get access to an exclusive 4 day Disneyland Resort Park Hopper ticket for the price of a 2 day Park Hopper ticket on Expedia. For this offer, tickets need to be purchased before the 31st March 2018, and must be redeemed before the 31st December 2018. See here for more details. In a park with 30,000 different cast members, with more than 100 different attractions, there are some easy ways to cut corners, but that’s a big no no at Disneyland. It will constantly catch you by surprise – for instance, in Disneyland Park’s Royal Theatre, there are daily performances of shows such as Tangled and the Fantasy Faire, and along with a crew of singers, dancers and crowd cajolers, there’s also a pianist who performs all of the musical accompaniment for the entire show. Similarly, over at the Hyperion Theatre inside California Adventure Park, the Frozen show singers belt their hearts out and will have you singing along to Let It Go live. Happiness is having one of the parks to yourself. There is something incredibly special about standing in front of Sleeping Beauty’s Castle all by yourself, or being the first to descend into the dark world of Pirates of the Caribbean before the diners fill the Blue Bayou restaurant at the ride’s entrance. If you’re staying on site at one of the three Disney resorts, Disney’s Grand Californian Hotel & Spa, Paradise Pier Hotel and Disneyland Hotel, you’ll get an extra hour inside one of the parks before opening hours in a designated theme park each day of your stay. Magic Mornings gives anyone with a 3 day or more Disneyland Resort ticket entrance to Disneyland Park for one Magic Morning. No, we’re not talking about staying inside the theme parks all day and night, although they do have pretty long opening hours, (Disneyland is often open until midnight). There are three hotels on site, so you can visit the park in the day and rest your head with that little bit of Disney magic at night. The notion of character dining can be confusing for Aussies, but once you’re watching your kids giving Goofy a big hug or seeing them share a cuddle with Chip ‘n’ Dale, you will wonder what you’ve been missing all these years. There are dedicated Character meet and greet zones in the park, but if you want to guarantee some time with Mickey, Minnie and the gang, without having to queue, character dining is the way to go. The hotels and restaurants in the parks offer dining for breakfast and lunch – always accompanied by a very decadent buffet. Waffles, pancakes, omelettes, cake, dessert pizza, normal pizza, ice cream sundae, roast meats, salads – you name it, it’s at the buffet. Disneyland is not just for the kids. From tiny bubs to great-grandparents, the resort has something for every age. Take the tweens to burn off some energy on Davy Crockett’s Explorer canoes (you may need to explain who Davy Crockett is but that’s ok), watch the little ones’ faces light up when Mickey’s Magic Map comes to life and wait for the screams of delight as even the adults get drenched on the Grizzly River Run. Disneyland’s famous fireworks and light shows are just the beginning of the nighttime entertainment. Downtown Disney’s shopping and dining precinct is a bustling promenade that’s busy from well before official park opening to well after dark. 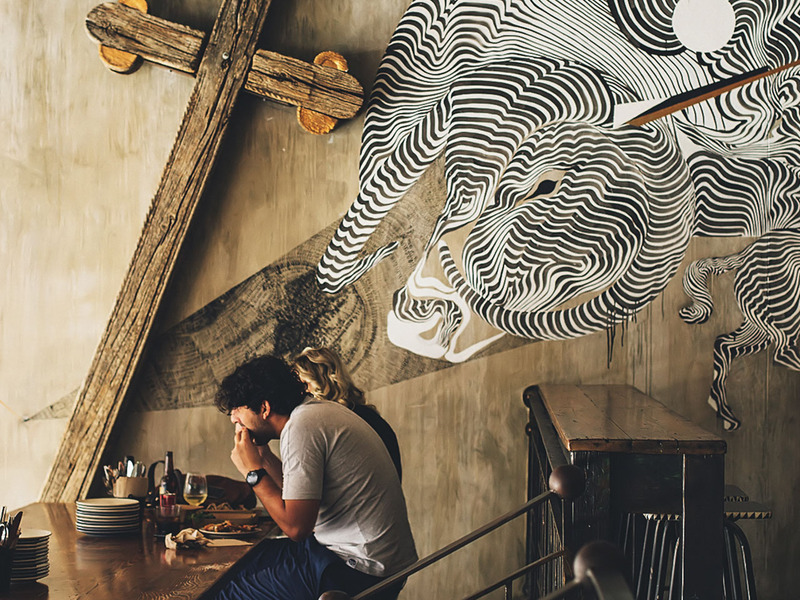 Dinner, drinks, live music, galleries, shops, Lego play stations, giant ESPN TV screens – there’s something for everyone.